What a difference a week makes. The -16°C of last weekend seems a distant memory after a week of quite mild temperatures. All the snow has gone and the soil has thawed out, which is quite fortunate because all our bare root hedging and coppicing trees arrived this week. Luckily the weather was favourable and we managed to get all the coppicing trees in the ground and about half of the hedging. 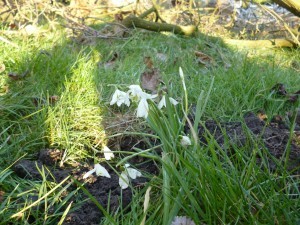 I also planted some Snowdrops and Bluebells in the green as well as some Ramsons (wild garlic). 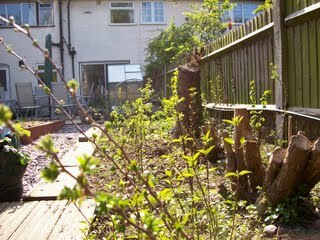 We purchased all our bare root plants from the hedge nursery ( here’s the link http://www.hedgenursery.co.uk/). 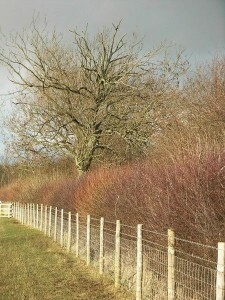 We chose the coppice mix, which is made up of Osier Willow, Ash and Hazel, to plant as part of our windbreak. We’ve basically planted a line around the middle paddock where the muck heap is. This paddock is about half way up the land. Together with the willow cuttings that we’ve planted at the very bottom of our land this will hopefully be quite effective at reducing the power of the wind. 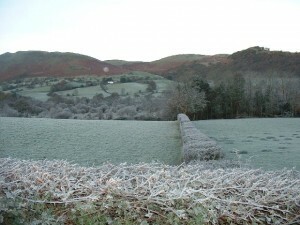 We also bought a native hedging mix made up of Hawthorn, Blackthorn, Hazel, Common Dogwood, Field Maple and Crab Apple. We’ve planted a single row of hedging along the perimeter of the horticultural area and we’ll plant another single row along the perimeter of the neighbouring paddock. The purpose of this hedging is twofold. Firstly, to further protect the horticultural area from the wind but also to provide a bit of biodiversity and flower/nectar supply around the horticultural area. In the future we would like to have bees and if we want them to stay we’ll need to make sure there is a plentiful food supply nearby. All of the land surrounding our smallholding is divided up into very large agricultural fields with little in the way of hedgerow; presenting a wide expanse of monoculture which isn’t particularly bee friendly. Together with our plans to introduce more native wildflowers hopefully Hooters Hall smallholding will become a little bee ( and other pollinators) friendly oasis amidst the desert of productive monoculture. 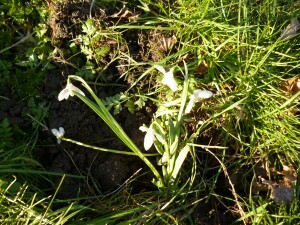 Here’s a picture of the snowdrops I planted, because they were in the green you get a very nice instant effect. 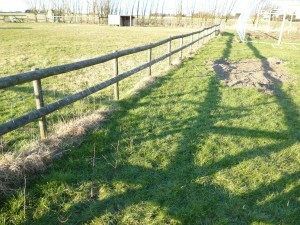 This picture shows the single row native hedging that we’ve planted along the perimeter of the horticultural area. You can see the polytunnel frame as well. This picture shows the coppice mix that we’ve planted as a windbreak about halfway down our land around the perimeter of the muck heap paddock. 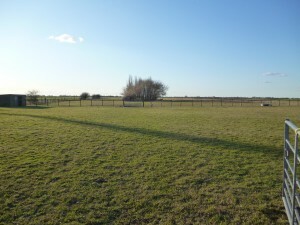 The second picture gives you an idea of where the paddock is situated in the land. 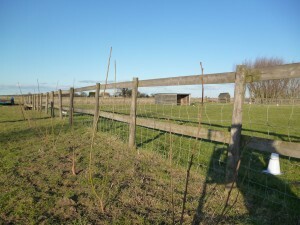 We’ve planted the bareroot trees all along both north to south running perimeters of the paddock. The wind seems to mostly come from the South West. Fingers crossed all the hedging and trees for the windbreak take and in a few years time the land should look quite different and be a lot less windy. As well as my snowdrops I planted some Ramsons (wild garlic) around the back garden and behind the polytunnel. 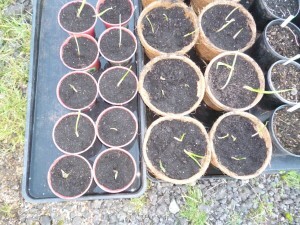 I also planted some in pots as bit of an experiment. 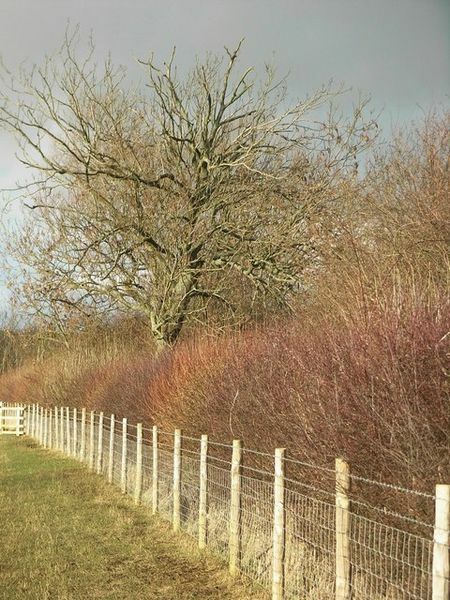 If the list of native shrubs and hedging posted yesterday got you thinking about hedging plants then have a look at the Hedgelink website to find out more about this habitat. There’s plenty of information for the back garden smallholder as well as those smallholders lucky enough to have a few acres of their own hedging. For those smallholders who are into their nature, science and conservation have a look at the Natural History Museums OPAL website. 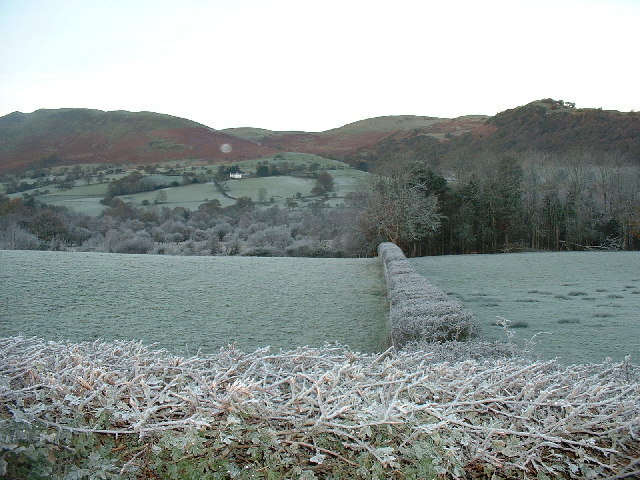 OPAL is the open air laboratories network and is currently undertaking a biodiversity survey to catalogue the range of wildlife inhabiting our hedges. You can contribute to the survey with the assistance of an easy to use workbook that you can download from the OPAL website. Native plants are one of my special interests, so when we decided to replant one of the borders in the garden experimenting with a bit of native hedging seemed like a good idea. 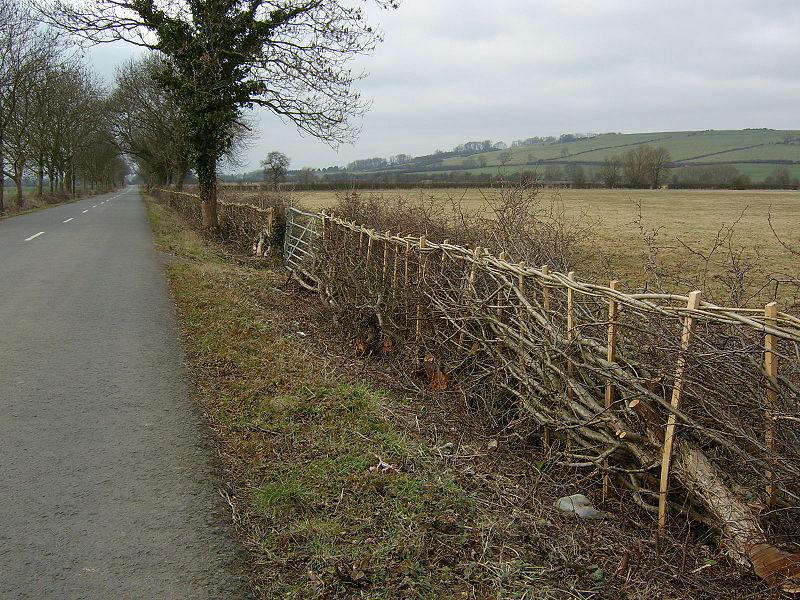 Ideally when we have our smallholding we’ll use native hedges along all the boundaries. 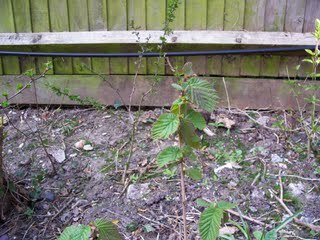 Even in an urban environment planting a small bit of native hedging will really benefit local wildlife;providing food for a wide range of insects and birds as well as shelter. If you haven’t got room for a whole hedge a few hedging plants in pots will do. When we started looking for places to get our hedging plants we quickly discovered that the most cost effective way to buy the plants was as bare roots. You can only buy bare root plants November to March, when the plants are dormant. Bare root is fairly self explanatory the plants are sent in bundles with their roots just wrapped in loose packing, no soil or pots. With this in mind it’s important to get them in some water if you’re not planting them out straight away. So you also have to make sure you’ll be in, or have a friendly neighbour to take the parcel when it arrives. We chose a native mix made up of 50% Hawthorn (Crataegus monogyna) together with Blackthorn (Prunus spinosa), Hazel (Corylus avellana), Common Dogwood (Cornus sanguinea) and Field Maple (Acer campestre). We planted them out in December, just before the snow, and it looks like all of them have taken. 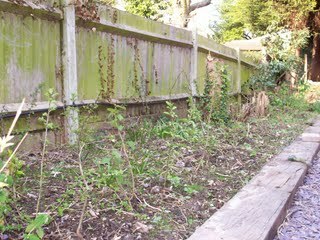 I’ve also sown a mix of hedgerow grasses and wild flowers around the hedging plants. I’ll keep you up to date with how the hedge progresses and there will be an article soon with some more in depth information on the specific hedging plants we’ve used. Here are some pics of the hedge.